How do children get to know their city and the city get to know its children? How often are children asked their opinions about their city? The UN Convention on the Rights of the Child (1989) established that in addition to children’s human rights to protection from harm and provision of an adequate standard of living, children also possess civil rights to participate in the cultural and civic activities of their communities. We, the authors of this article, maintain that children are indeed citizens from birth with the right to participate in the civic life of their cities. Cities belong to the adults and children who live there—even young children, who are capable of generating compelling insights about their communities. How might we help children imagine their futures as active members of their communities? 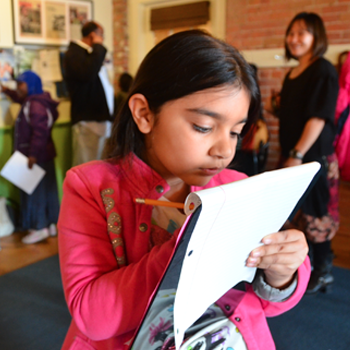 Schools are an ideal setting for fostering a dialogue between children and the city. Like the ancient Greek agora, classrooms can serve as laboratories for life in a democratic community—places where knowledge and culture are both created and transmitted. When children encounter other perspectives—when they discuss, argue, and compare ideas—they are building understanding and making public that which had been private. Cities also provide a construct that three-, four-, and fiveyear- olds can understand—places they can experience and to which they can respond. This article is written for those who wish to foster a relationship between children and their cities. We start with two examples of children’s contributions to their communities, one from Reggio Emilia—a city with a long and rich history of connecting children to their community, and one from Washington, DC—a city that has more recently built child-community connections. We close by identifying three lessons learned about engaging children in their communities. Download the PDF (under Resource Links) to continue reading this article.